The goal of any security system is to protect assets, gather information, and limit loss. All cameras, sensors, and devices contribute to this goal, however verified video solutions provide a better class of security because they give law enforcement the information they need to respond faster and apprehend more criminals. 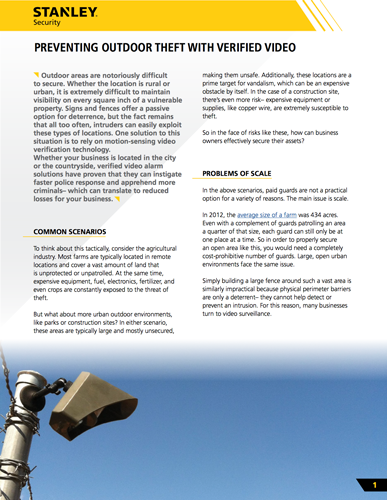 Providing total visibility to large outdoor, hard-to-secure areas, such as construction sites, parks, and agricultural areas, can be a monumental challenge– and in many cases, simply not feasible. This article provides a few key insights and best practices that can help you keep your business more secure.